Worchester-Union Station is a grand French-Renaissance station designed by the Philadelphia architects Watson and Huckle modeled after a Roman basilica. It was built by and served the Boston and Albany, New York, New Haven and Hartford, and Boston and Maine Railroads; these fallen railroad names are still engraved in the marble above the entrance to the station. The station opened in 1911, was boarded up in 1972 and in 1981 main waiting room had fallen into ruin, its stained glass vaulted ceiling missing. 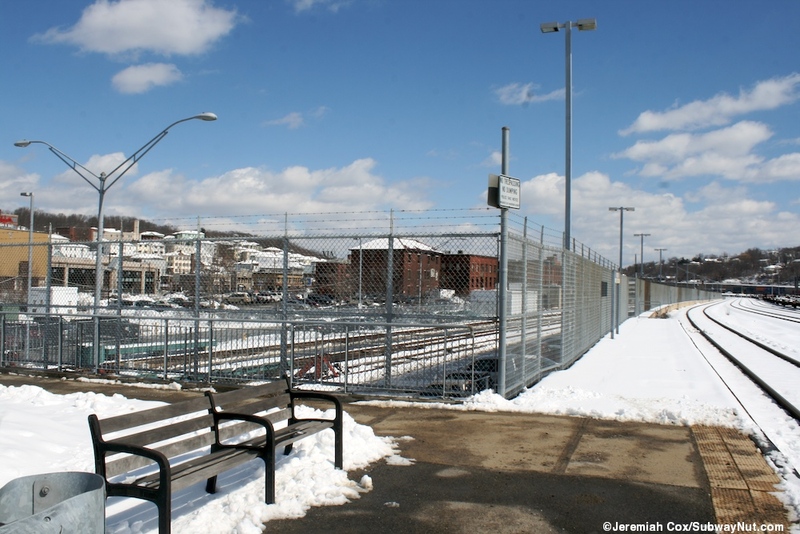 In 1992 an alliance formed to find funding to restore the station, and in 1998 a $32 million renovation began. The station reopened to railroad passengers in July 2000. Intercity Bus service arrived at the depot in July 2008 in form of Greyhound-Peter Pan. 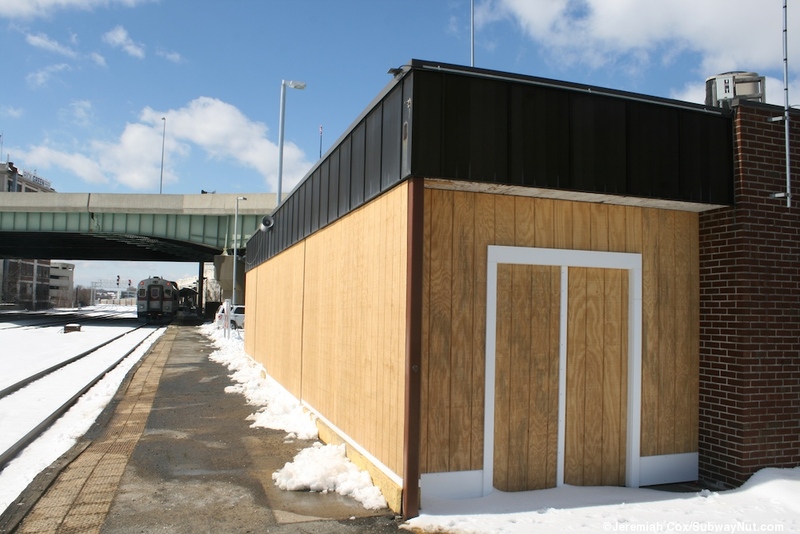 A new downtown transportation center for the local Worcester Regional Transportation Authority (WRTA) in April 2013 will open across the street. During the time that Worcester Union Station lay in abandonment the train stations was housed in a small modular looking AmStation. This building still exists today (I assume this was the Amtrak station) and is at the other end of the extremely long, single station platform on the opposite side of the I-290 overpass from Union Station Station. It has light brown modular walls and a flat black roof. 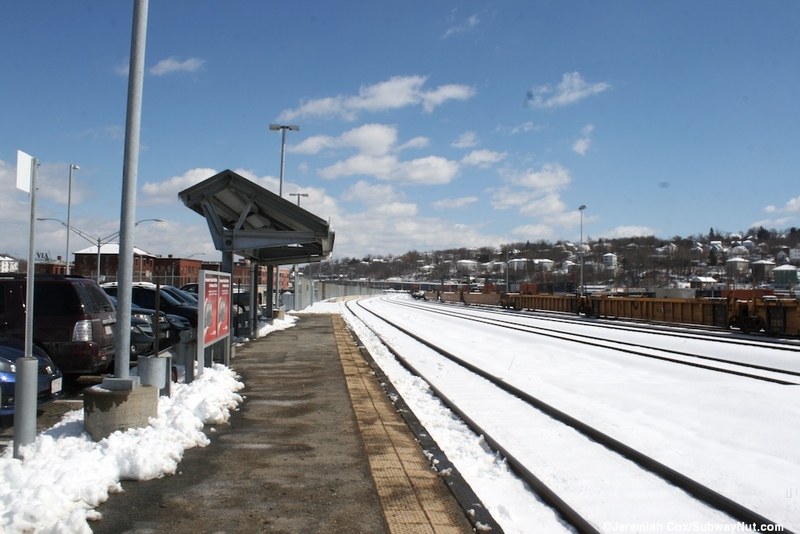 It is surrounded by the MBTA commuter parking lots with the long platform providing the main connection from parking lot to trains and inside Union Station. 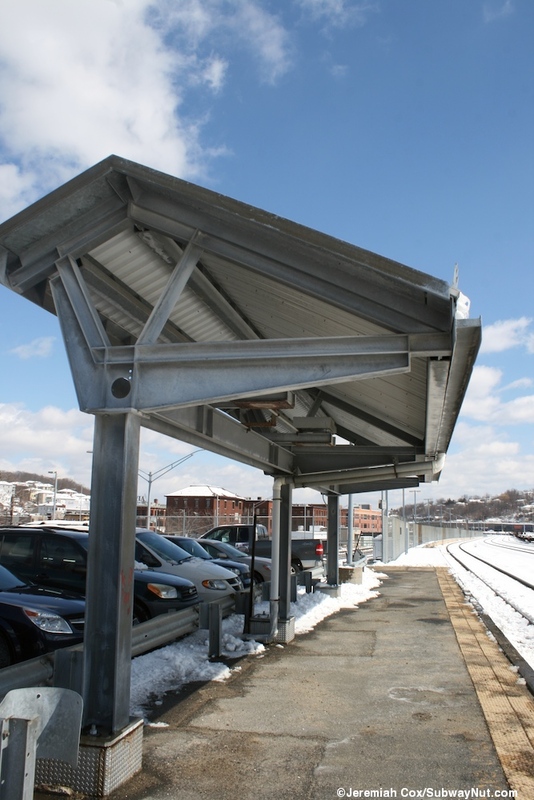 Since there are no ticketing services for Commuter Rail passengers the station is purely decorative for them and provides a heated waiting area. Like the train station that lay abandoneored for 30 years, train service to the station has an equally interesting history. 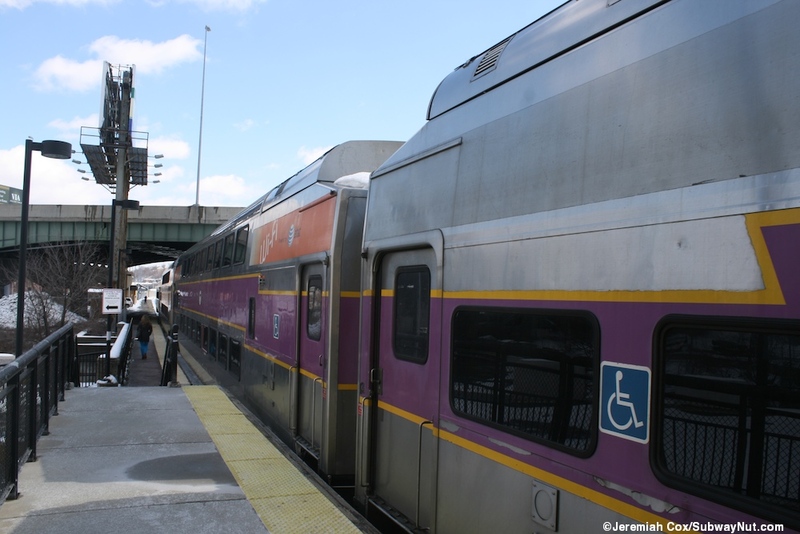 The stop has always been on the Inland Route via Springfield between New Haven and Boston, compared to the Coastal Route via Rhode Island that most trains serve and was electrified in 2000. 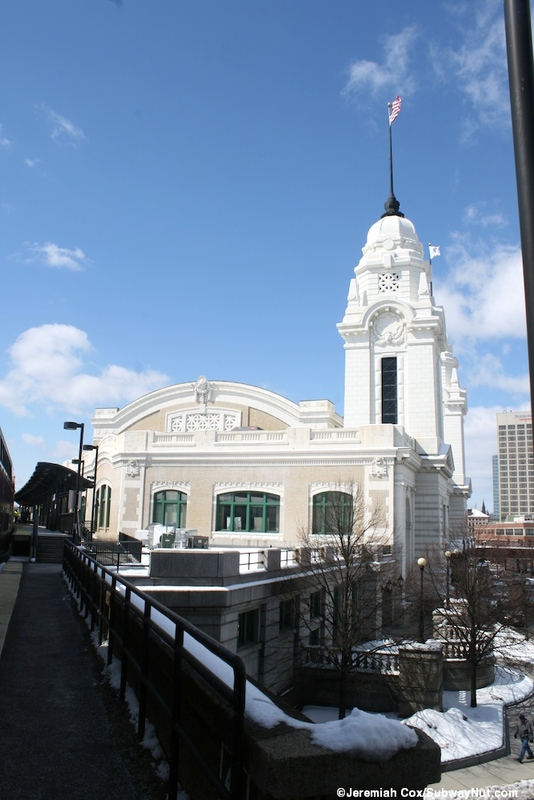 In May 1971 on Amtrak-day, PennCentral continued to operate commuter rail service to and from Boston-South Station with Worcester as the terminus but all intercity service from the station was discontinued. 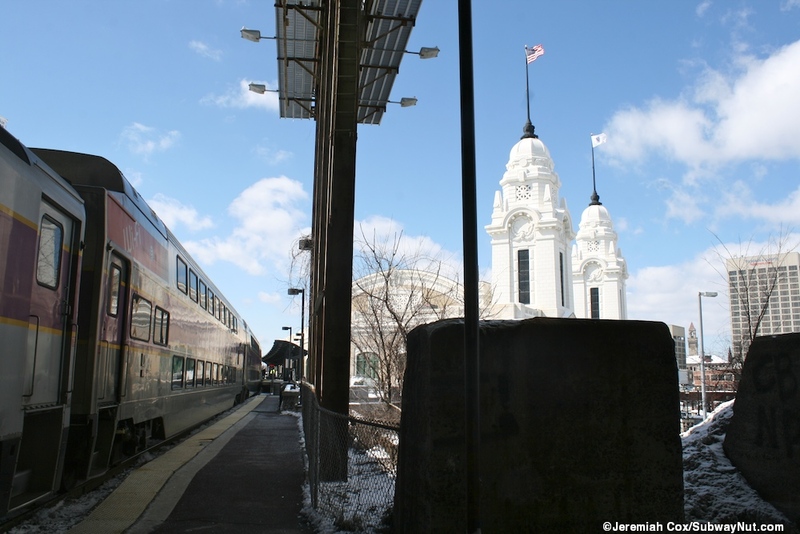 Just two weeks later on May 17, 1971 Amtrak added a train that became the Bay State between Philadelphia and Boston via the Inland Route stopping at Worcester. This Northeast Corridor daily, called the Connecticut Yankee in some years and then getting the Northeast-Direct name ran almost continuously (it was discontinued a few times) as a one daily train from Boston to Washington (in 1996 all the way to Richmond, VA) via the inland route instead of the coastal route in its last years it became an Acela Regional. In 2003 it was became a weekend only service and with the November 1, 2004 timetable all service via the Inland Route was discontinued (the trip between Boston and New Haven via Springfield now took 2 hours longer compared to the now electrified coastal route instead of just about an hour). The Inland Route service since October 31, 1975 has been supplemented by the Lake Shore Limited across Massachusetts to Albany combining with a New York section to Chicago (A cross platform transfer in Albany was required between 2003 and 2008 with Boston service provided by a separate coach only train). The Lake Shore Limited today is the only train to stop of Worcester with a ticket office open on weekdays still providing checked baggage service. 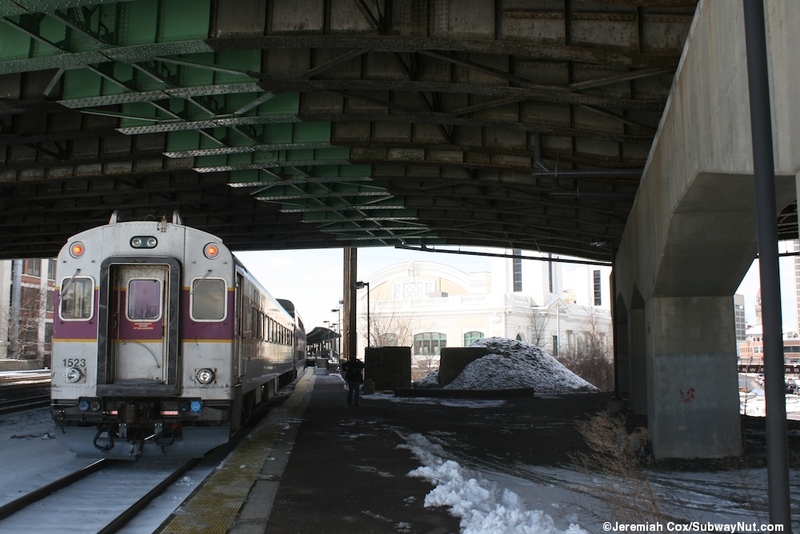 Commuter Rail service into Boston (always terminating at Worchester) was discontinued and cut back to Framingham on October 27, 1975 as the MBTA decided not to subsidize it. 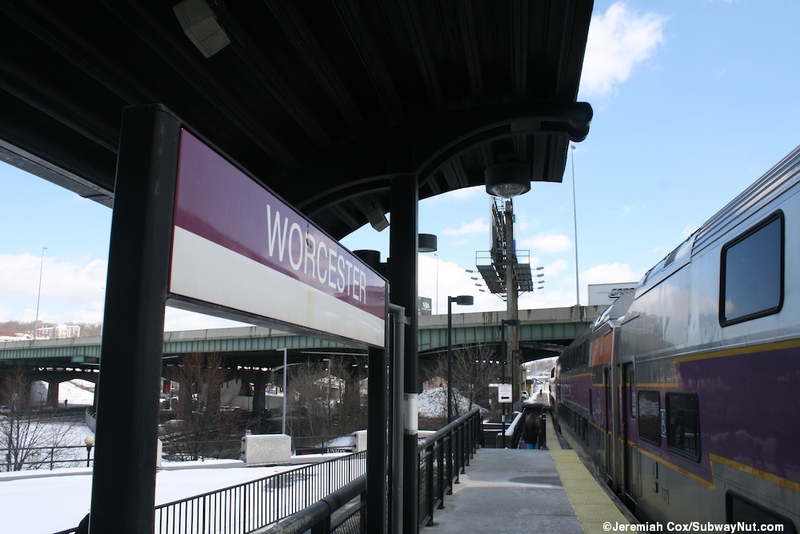 19 years later on September 26, 1994 limited rush hour MBTA commuter rail service was restored to Worchester, making no intermediate stops to Framingham, off peak service was added beginning on December 14, 1996. 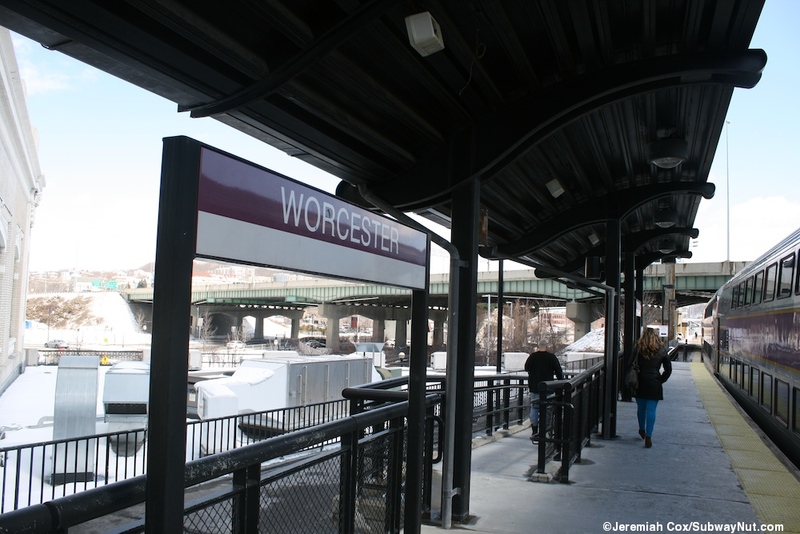 Intermediate stops were built between Worcester and Framingham between 2000 and 2002. 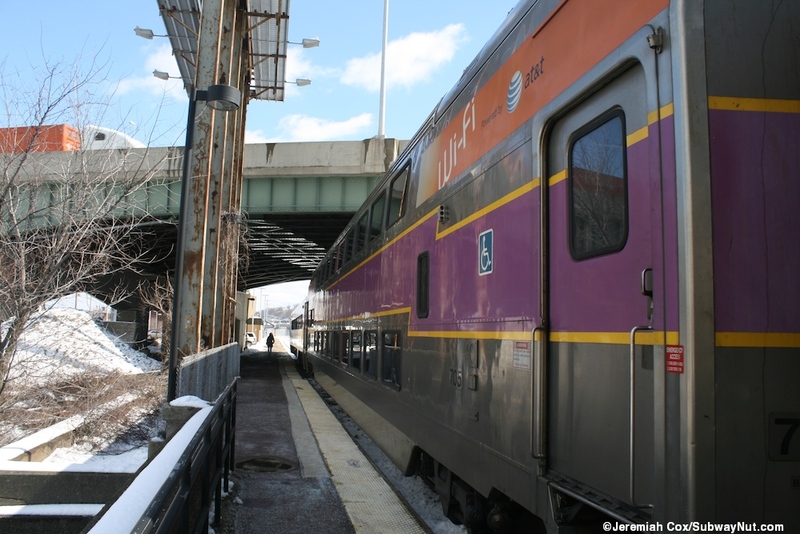 The MBTA has been increasing the number of commuter rail trips with more added with the October 2012 timetable. Today there are 16 inbound and 15 outbound weekday trips with 5 weekend round-trips. 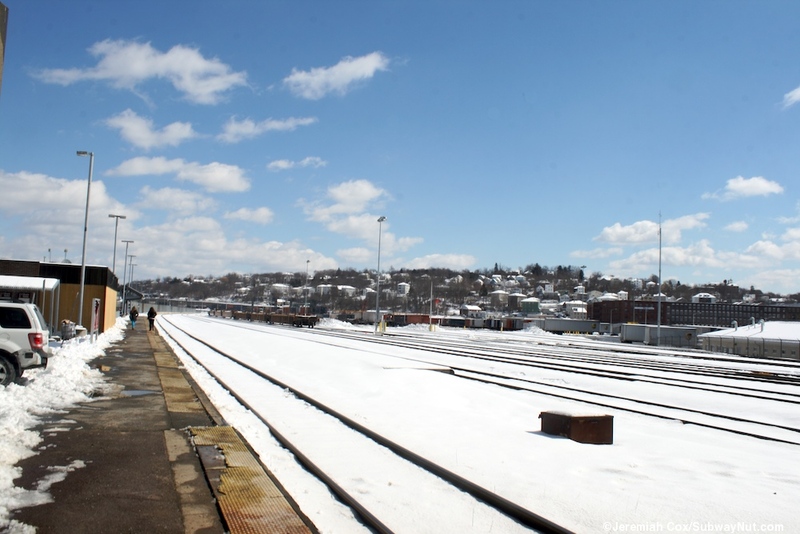 The MBTA has a small four track storage yard east of the station (at the eastern end of the platforms) across the large intermodal CSX yard that begins at the eastern end of the station. The place to start a tour of the station is outside, in Washington Square set back from a rotary formed by Grafton and Front Street. Just west is the elevated highway viaduct, of I-290. To the east is the freight tracks owned today by the short-line Providence & Worcester Railway and on the other side of the tracks from and beneath them the 5 Greyhound/Peter Pan Bus Bays. 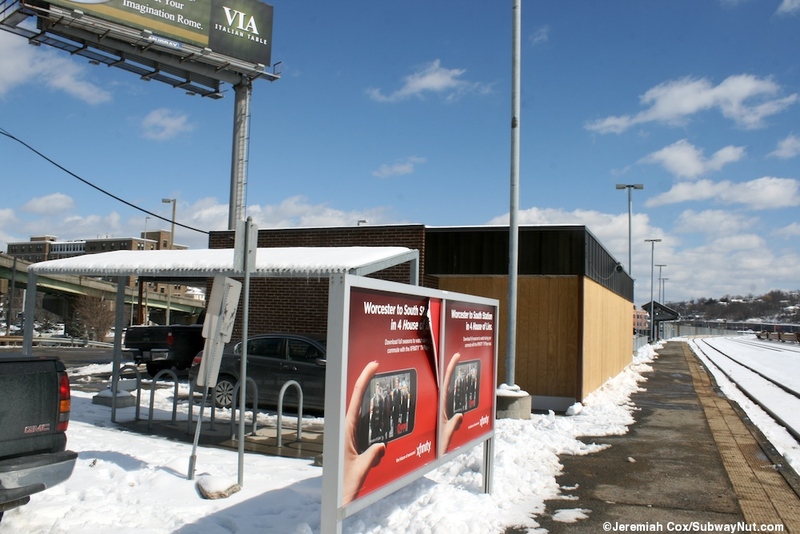 These have a canopy and access from either Front Street or their own direct entrance through the station. Above the bus bays (across from the remains of a station platform) are a bunch of flagpoles with both municipal and corporate flags for the railroads at the station flapping in the wind. The station has a small car loop that goes uphill to the main entrance beyond the rotary. In the plaza is a white marble statue of Christopher Columbus erected in 1978 by the Italian Community of Worcester. There are also signs in the plaza for Union Station (2 Washington Square) listing the tenants, including a restaurant, the event space that closes the great hall off to the public, some offices and MBTA Commuter Rail, Amtrak, Peter Pan and Greyhound in a simple black on white font, without logos for the transportation operators. The actual facade of the train station is white marble with two towers on each side of the main two stories and entrances. These towers have flags above them. The main entrance has a black iron canopy that covers the doors into the station. Entering the station passengers first reach a small marble walled entrance room that feels more like the entrance to an office building than a train station. Here staircases and an elevator lead up to the offices on the second floor. Going through multiple sets of doors leads to the great hall. It is one of the hidden gems of great restored railroad stations. This room has a tall arched ceiling with tons of stained glass and hanging chandeliers. There is a clock along one wall with other glass windows. The walls are gray stone and cream colored It was originally the main waiting room. There are seals for something in the ceiling skylight. Continuing through here on the opposite side of the waiting room from the entrance hall are doors (and windows) into is a crescent shaped area with a balcony and staircase that wraps around up to it. The first story starting from the eastern corner has the small Amtrak ticket office followed by a spot that could be (and maybe once was) an MBTA ticket office but now just has an MBTA LED sign. Next is a statue of Jerome Wheelock who Invented and Manufactured Steam Cylinder Packing and Horizontal Steam Engines of Corliss Type in the Wheelock Engine Company in Worcester. 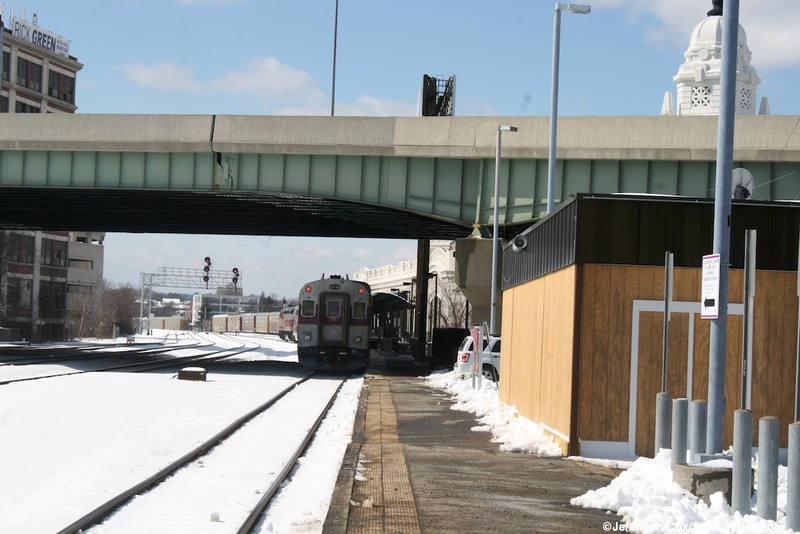 Continuing around is the security office and a walkway underneath the train trains that leads to a modern 200+ space parking garage,open and out to Franklin Street on the opposite side of the train tracks and closer to downtown. Next is a small cafe with coffee and packaged muffins and sandwiches. The final amenity is a staircase down beneath lettering for Buses to the Greyhound-Peter Pan ticket counter followed by a small waiting area and doors out to the bus bays. To reach the trains passengers continue up a staircase to the balcony of the crescent shaped waiting area. This has some of the station's private offices. There are also some benches to wait at. Doors lead out to the railroad tracks on an embankment above. 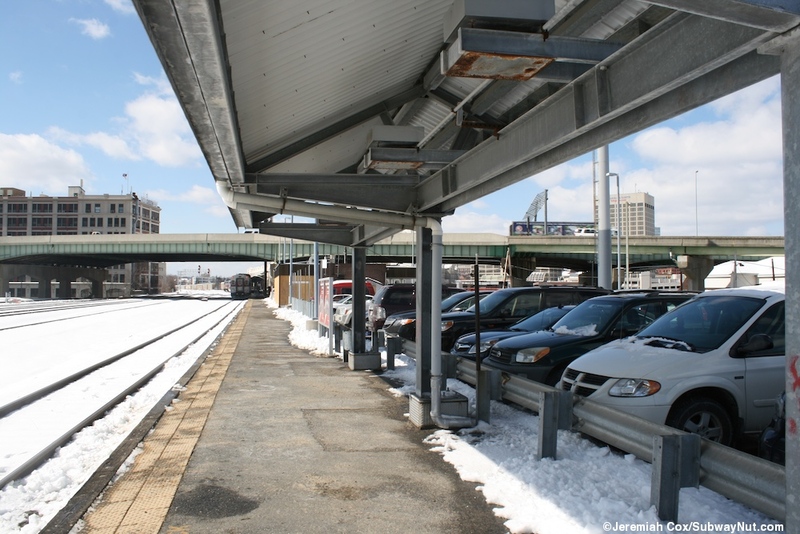 On the northernmost of the 4 5 southern tracks (that lead two a yard) used by Amtrak and MBTA is a glass canopy that extends to the station building and connects directly to a modern high-level side platform that accommodates about six cars. 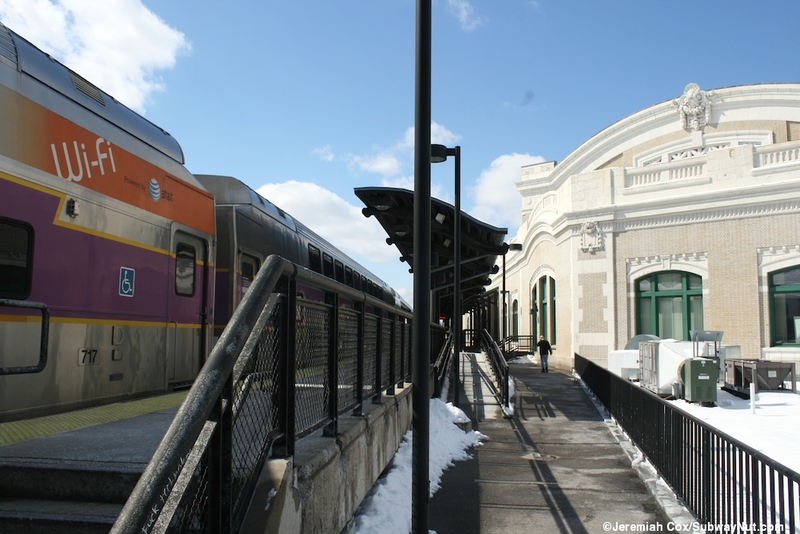 This platform has stairs and a ramp up to it with a modern MBTA silver canopy and standard MBTA signage. The west side of the station (it is nearly triangular shaped) are two Providence and Worchester freight tracks. Black posts that hold up what seems like a canopy and silver framework above it that looks like a awning might be hung from it in summer. 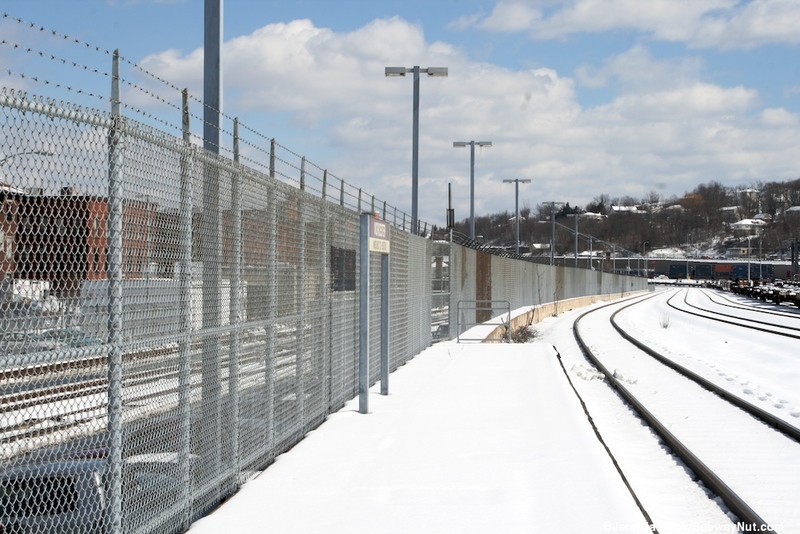 A low fence separates the freight tracks from the station. 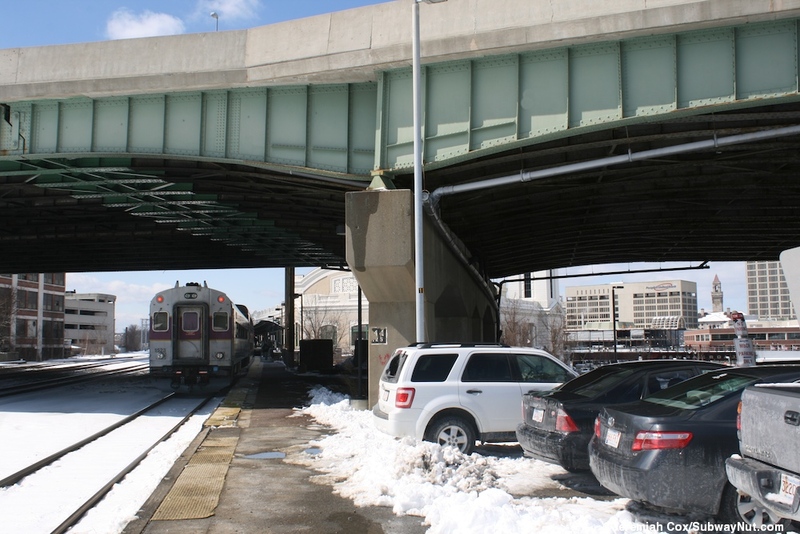 The MBTA platform becomes low-level and continues south of the station a long ways beneath I-290 before reaching a few staircases down to parking lots with 150 parking spaces. 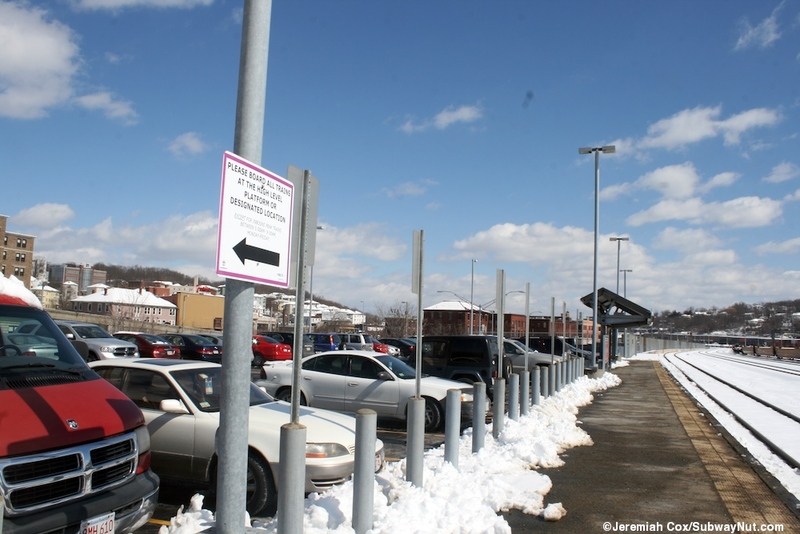 These parking lots have signs for Parking For Railroad Passengers only and include the Amtrak pointless arrow logo in only blue. It is also here that the small original AmStation still exists and looks unused or is in use for storage. The platform finally comes to and end here and there are signs informing passengers to board all trains on its high-level portion. 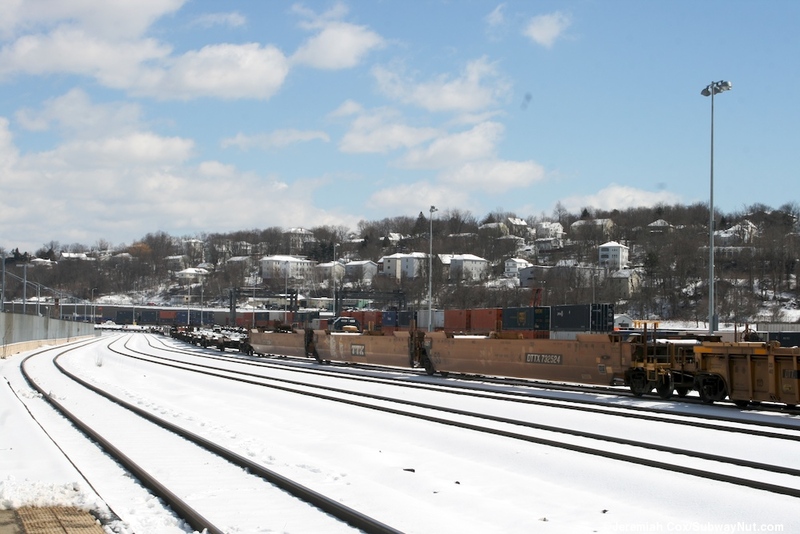 The view from the eastern end of the platform is of the large intermodal freight container terminal beyond the station area. No fence, just no trespassing signs separates the tracks that serve the passenger station from the intermodal yard.